The renovation that turned a duplex into a dream home. St. Louis artist Ted Collier's artwork is featured prominently in the dining room and family room. Once owned by the French fur trader Jules DeMun and established in the 1920s, the neighborhood of DeMun is known for its historic buildings and classic charm. These factors attracted Mark and Stephanie to the neighborhood, but the fixer-upper they found sealed the deal. 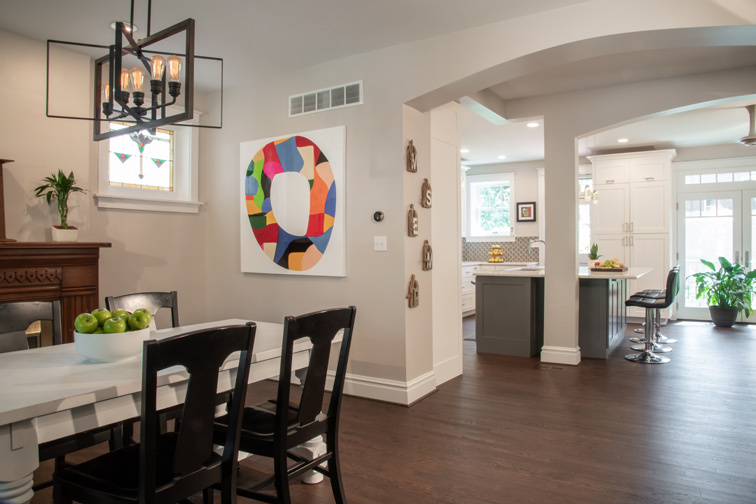 Working closely with designer Mimi Pultman of Mimi Pultman Interiors, they updated a home to fit their needs and style. 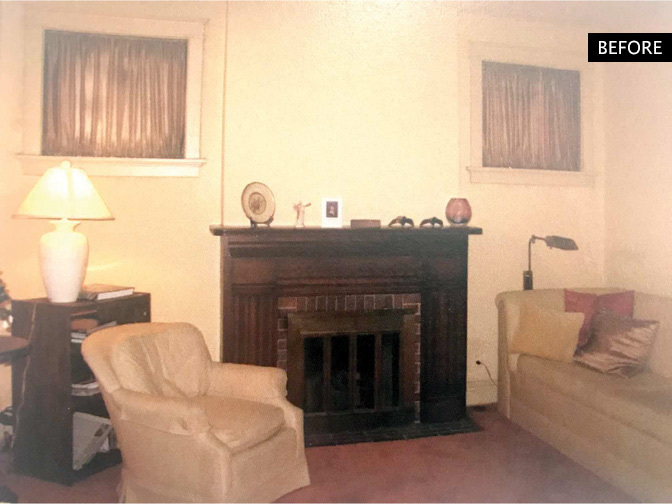 But there was a catch: The home began as a duplex and is listed on the Historical Registry. These were the two toughest aspects of the renovation. 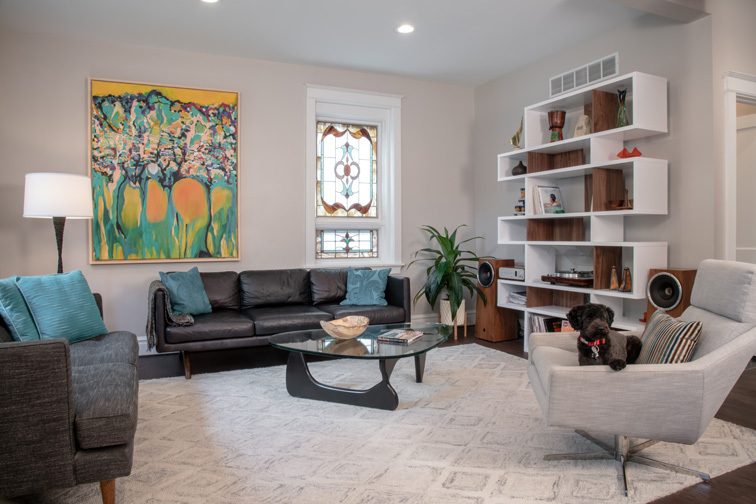 “Because it started as a duplex, there were structural limitations to work around, like the stairwell and plumbing, and they needed to create a functional design while still respecting the historical integrity of the original design. Both factors ultimately added to the unique beauty of the home,” Pultman explains. 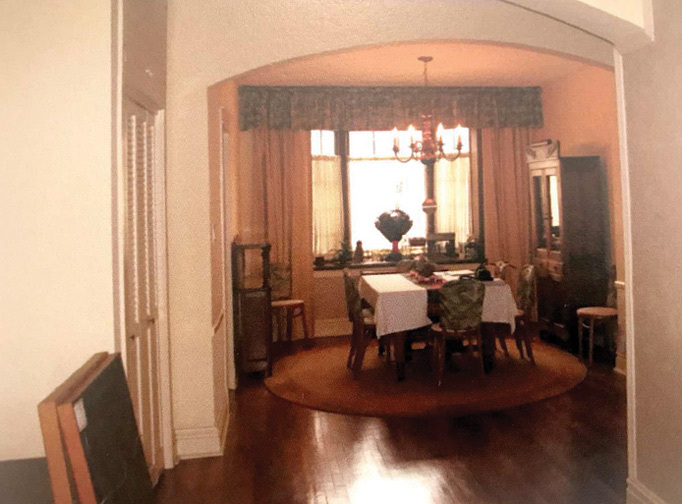 The family sat down with their architect to discuss what renovations they could do to the existing design. They wanted to turn the tight space into an open floor plan, which meant they had some load-bearing walls to work around. Taking out several key walls and adding columns to support the structure allowed them to open up the first floor and create the frame for their soon-to-be renovated family room, kitchen and dining room. 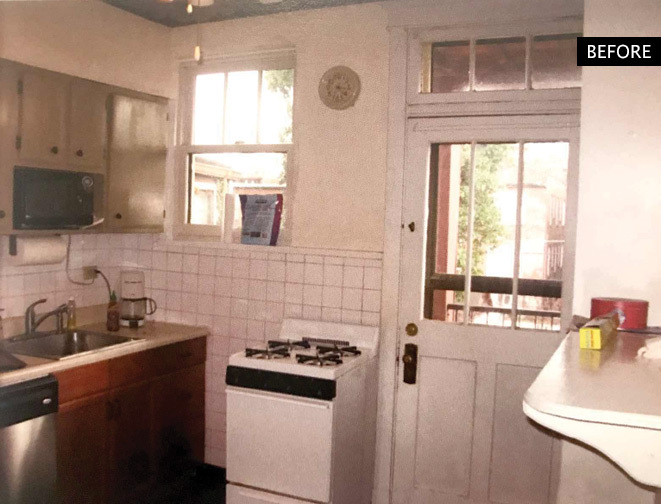 “The biggest challenge of the project was the complex interior demolition of an already beautiful property and not knowing if it would come together the way we hoped,” Stephanie says. 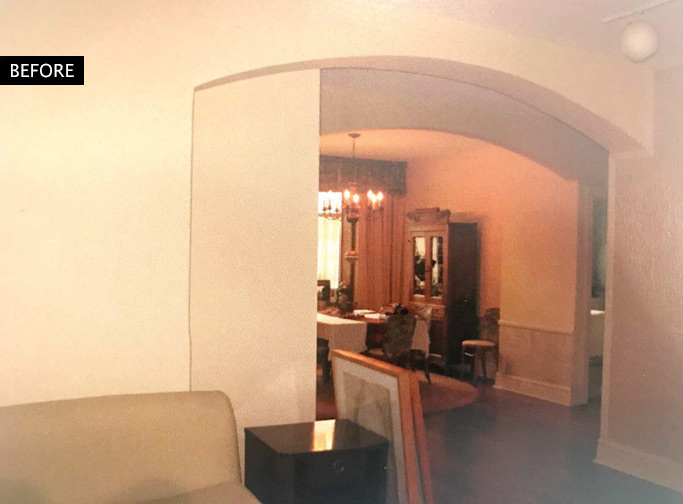 To protect the home’s historical integrity, the family worked with Pultman to match the original baseboards, trim work, plaster and archways. 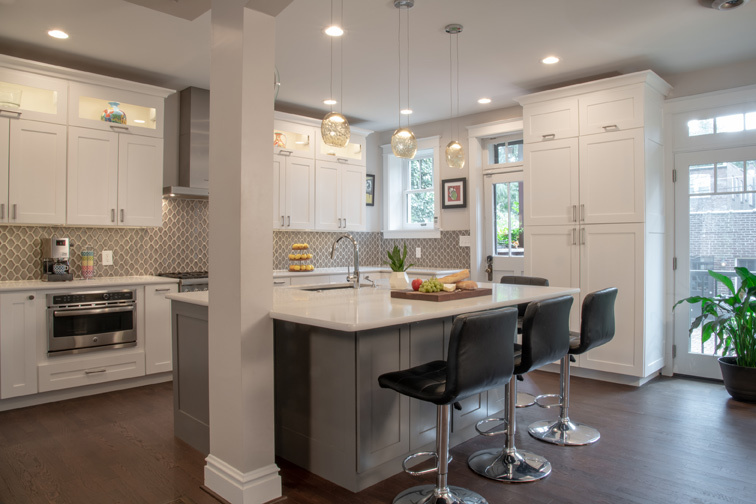 While these aspects were preserved, they were able to update the HVAC, electrical and plumbing to modern standards and redesign the home’s interior to match their style. 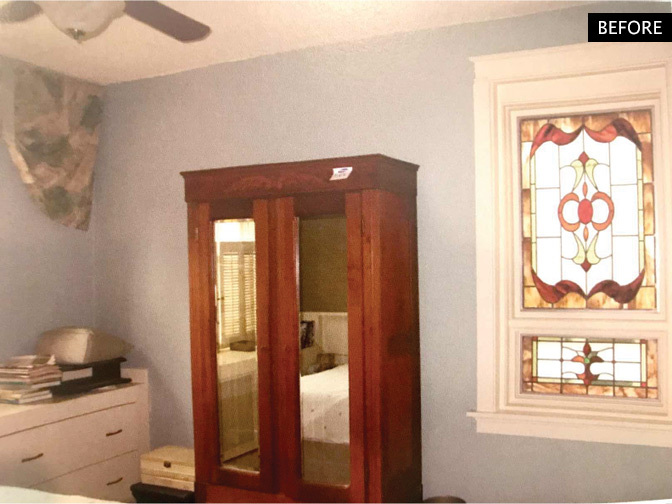 This home renovation followed all historic guidelines and remains on the National Registry of Historical Homes with its original stained-glass windows, doors, archways and trim. With the popen concept brought to life, light now streams through the stained glass to illuminate the rest of the home. This, paired with a lighter paint color and new cabinets, provides a more comfortable and liveable feel. 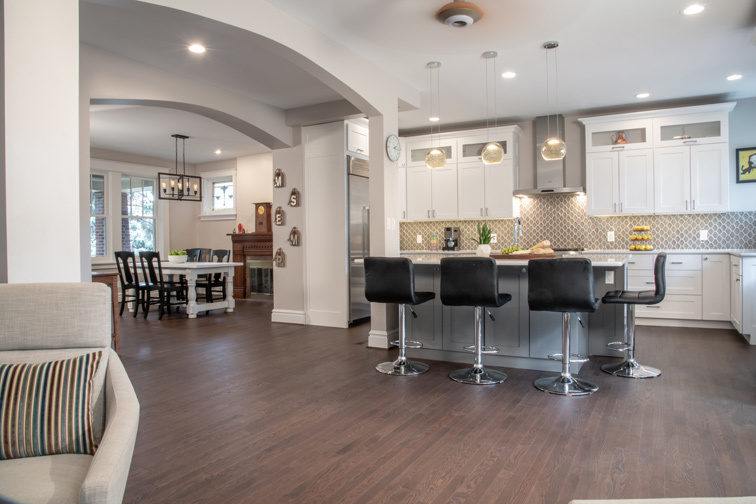 These renovations not only made the space easier to navigate, but also provided the family with a home that can accommodate growing children and evolve as the family needs change.